What will 2017 bring for you? Hardly anyone knows. We begin each new year with new hopes, dreams, and goals of making changes to our lives. Or perhaps our lives are perfectly fine and there isn't anything we want or need to change. Whatever your mindset, change requires effort, determination, and tons of perseverance. Rewind back to January 1st 2016, I made 3 goals for myself: get published, get organized, and lose 10 pounds, which just so happened to be the same 3 goals I set for myself in 2015. And embarrassingly enough, if I'm being perfectly honest, those were probably my goals in 2014 also. So if I've been working towards the same goals for at least 2 years, why haven't I achieved any of them? Laziness? Fear? Maybe a little of both? Or perhaps sheer overwhelmedness (yes, I know that's not a real word). You know the feeling I'm talking about, where you have so much going on that when you do have actual free time to get something accomplished, you don't know where to start or even have the energy to do anything else? Or maybe that's just me. Or perhaps it's the feeling when you try hard at something for a short period of time, but you don't see any results and you give up or become discouraged. As a side-note, my 2016 was nothing to be sad or mopey about. It was actually pretty awesome. I went on four great vacations. Visited 5 states, traveled in 4 different countries, took my children on their first plane trip. I completed my first year in a new position at my school. Played, laughed, ran, and made many memories with my family and friends. Not to mention that I am blessed with two beautiful, healthy children, a wonderful husband, a great job, and a fantastic family and friends. The truth is, achieving your dreams is not possible without heart and a whole lot of hard work. I will never reach my goals without making a conscious effort to work towards them. I will never publish my first book without spending time writing, each and every day. Although, I made a start in 2016, three blog posts and an outline aren't going to get my novel published. Likewise, I'm never going to get organized by doing the daily chores that need to be done and nothing more. I'm going to have to put in hours of time to get things to a functional point and then I'm going to have to work to keep things organized. And those ten pounds, well, I'm likely never to lose them unless I change my eating habits permanently. Instantaneous results will not happen and in all honesty, 365 days may not be enough to get my goals accomplished, but hopefully by this time next year, I will have made some progress toward these goals. Why am I telling you all of this? You probably have goals and dreams of your own to focus on that differ from those of my own. My purpose in writing this is two-fold. 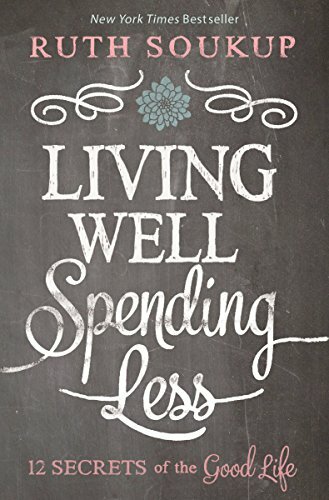 A few months ago, I read a book called Living Well Spending Less by Ruth Soukup. When I was reading what she had written in her book, there were many times that I thought, “wow, she’s talking to me.” Although I knew that she wasn’t writing this book for Amy Fields, there were many things that she wrote that really stuck with me. So my thought in writing this blog post is that maybe there is someone out there who reads this post and feels the same way that I do, overwhelmed and scared of their goals, but ready to put in the hard work that it takes to accomplish those staggering goals. Maybe we can lean on each other and push each other to achieve those goals. The other reason I’m writing this is to hold myself accountable. By putting my goals out there in the wide-open world of the Internet where anyone can read them, I’m more likely to be working towards them. I honestly hope that I if I run into you on the street sometime soon that you’ll say, “Hey, Amy. How’s your book going?” Hopefully, my response will be positive and more than, "I have an outline." Happy 2017 to you! May this be the year where your dreams come true!